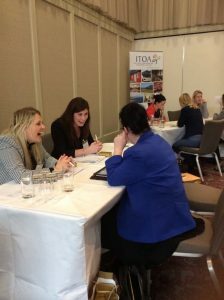 The Incoming Tour Operators Association (ITOA) of Ireland, in partnership with Tourism NI, hosted its first ever business-to-business workshop to be held in Northern Ireland at the Titanic Hotel Belfast on November 13th. The event was part of the Associations plans to mark the 40th Year of the Association. The Belfast workshop saw over 750 appointments take place in one afternoon between 30 ITOA member companies and 95 delegates from 80 companies representing the Northern Ireland tourism industry. 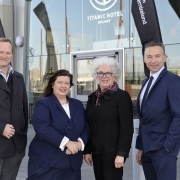 Following a packed schedule of networking appointments at the Titanic Hotel delegates enjoyed a gala dinner at the Crumlin Road Gaol this evening including a showcase of local food and entertainment. 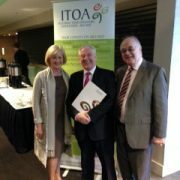 Minister for Tourism & Sport Michael Ring visited the ITOA Workshop in the Limerick Strand today where he congratulated the ITOA members and tourism businesses present on their hard work and dedication in delivering the very best experiences to our overseas visitors. 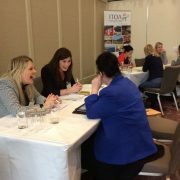 He remarked on the enthusiasm of the tourism industry in promoting the Wild Atlantic Way – “The Wild Atlantic Way is a terrific opportunity to package and promote all of the wonderful areas and product along the Atlantic seaboard and it’s here to stay and will serve the industry well for years to come”. 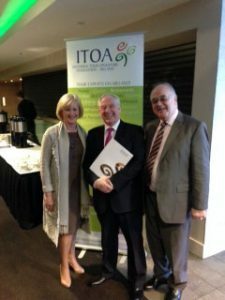 Sue Uda, President of ITOA thanked Minister Ring for his support of the industry over the past 3 years “we greatly appreciate the support that you, Minister Varadkar and your Government colleagues have given the industry over the past few years.